Live from the Boston Apple Store, Boylston Street Opening! 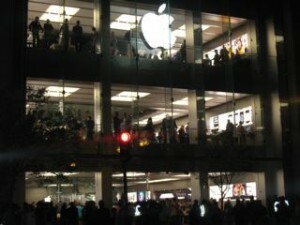 theiLife.com will be covering the Boylston Street Apple Store opening, beginning at approximately 5PM Thursday, May 15th. All updates and pictures will be contained on this post so make sure you check back for updates! 4:57 PM Matt here, I am in New Jersey awaiting updates from our crew out in Boston. 5:04 PM If you want to find out more information about the new Boston Store, you can check out yesterday’s article here; or on ifoAppleStore. 6:00 PM The store is now officially open! Still no word from our on-site corespondents. 6:05 PM Adam is in line. He notes “[there are] more iPhones per capita in this line than anywhere I have seen other than 1 Infinite Loop” Picture added below. 6:13 PM Adam has sent another picture and notes that there are a number of news crew in attendance. 6:31 PM There are helicopters flying above the area. Another picture has been added, which Adam believes is the cause of the helicopters. 7:43 PM Adam is just leaving the Apple Store. He has inclosed a picture of the T-Shirt below. Apple Store Boston – Boylston Street Grand Opening! For those living in or near Boston, Apple has finally brought you good news- tomorrow, Thursday May 15th, you will be getting your first Boston Apple Store! On April 28th, the facade of the upcoming Boylston Street Apple Store appeared, modeled after the Green Monster and reading “Opening Day. Coming Soon. Apple Store Boylston St.” Last week, ifoAppleStore speculated that the store was set to open next Friday, May 16th. Earlier this week, Apple officially announced the grand opening to take place on Thursday May 15th. This is the first flagship store launch since then opening of the West 14th Street Apple Store in New York City, back in December of 2007 (which you can read our coverage of here). The new store is said to have 3 floors (like the West 14th Street Store) and over 20,000 square feet of retail space and even a vegetation garden on the rooftop. 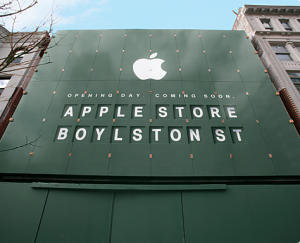 The Bolyston Street store is confirmed to be Apple’s largest retail store in the United States. At the grand opening, which takes place at 6:00PM tomorrow, Apple will be giving away limited edition T-shirts and “other surprises”. The store will operate under extended hours (8AM-11PM Monday-Saturday; 9AM-7PM Sunday) but will not be open 24/7, like the 5th Avenue Apple Store in New York City. You can find directions and a calendar of events on Apple’s website, or read more about the store on ifoAppleStore. 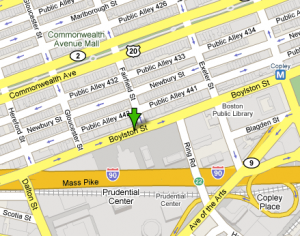 The store is located is located at 815 Boylston Street between Gloucester and Fairfield; Boston, MA 02116. If you are planning on attending or would like to attend, theiLife is still in search of any one willing to report for our us. There are absolutely no requirements and any pictures, videos or text updates are highly appreciated! If you are interested, you will be given access to our FTP servers and a WordPress account to post updates, pictures or videos. Please contact us via AIM, email or by post a comment below.